Record Company – MCA Records, Inc. Copyright (c) – Backstreet Records, Inc. Copyright (c) – Universal City Studios, Inc. Noises [Wind] – Winds, Inc.
© ℗ 1982 Backstreet Records, a division of MCA Records, Inc. Printed in USA. Some copies used for export might bear a golden stamp on back reading "EXPORT ONLY FOR SALE OUTSIDE CONTINENTAL UNITED STATES ONLY VENEZUELA"
This release is a MCA Pressing Plant, Gloversville pressing as indicated by the stamped ⧈-G-⧈ in runouts. Label variation. These labels with SIDE ONE / SIDE TWO and matrix number on labels without ( ). 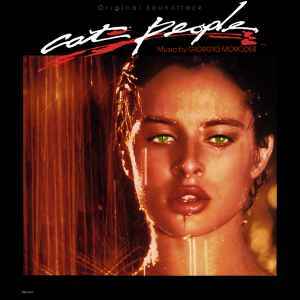 Another similar pressing "Cat People (Original Soundtrack)" with Side 1 / Side 2 and matrix number on labels with ( ). Matrix / Runout (Runout, sides A & B, stamped): MASTERED AT ALLEN ZENTZ L.A., CALIF.